Engineering – TeeMark Manufacturing, Inc. 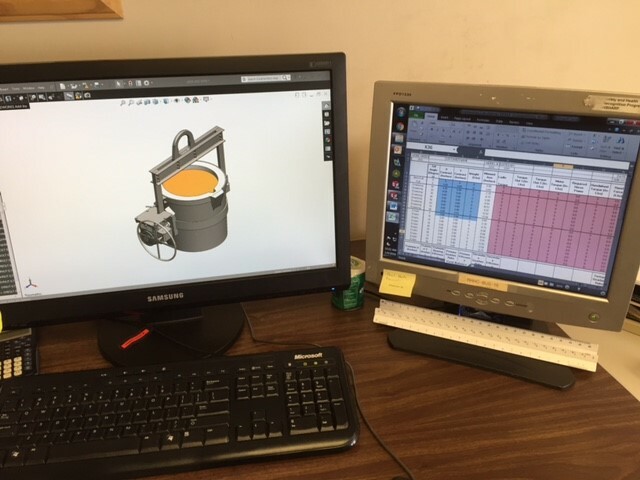 Here at TeeMark Manufacturing Inc. we have engineering staff on site to design both standard and custom D&E Ladles utilizing 3D modeling. The Engineering team works with SOLIDWORKS and other computer software to ensure the integrity and safety of each ladle. The use of this software allows TeeMark MFG to provide tighter tolerances on balance. In the event of a catastrophic failure of the tilting mechanism or other mishaps it is of the upmost importance that the ladle rights itself, therefore getting the balance correct is important to TeeMark MFG. All materials used are put through rigorous stress analysis for safety purposes. Communication during the designing and ordering process is crucial. To ensure all parties agree to the size and design of the requested ladle there are a few steps that we follow in our quoting process. 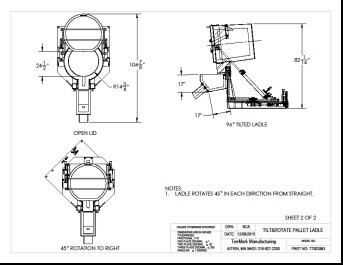 First, a quote for the requested ladle size is provided with a general arrangement drawing. After that has been sent the Engineering department works with the measurements given to come up with a workable design for each customer. 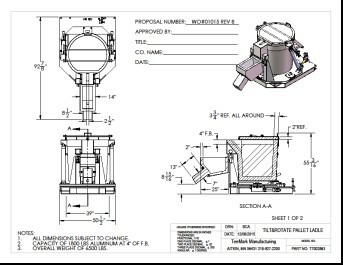 Before issuing the work order, an approval drawing is sent to the customer, this drawing is then reviewed by the customer and when TeeMark receives an approval signature the ladle is then ready for our team to manufacture.